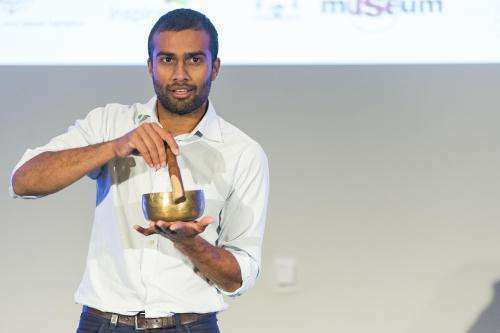 Dr Niraj Lal, of the Australian National University, found during his PhD at the University of Cambridge, that small nano-sized versions of Buddhist singing bowls resonate with light in the same way as they do with sound, and he's applied this shape to solar cells to increase their ability to capture more light and convert it into electricity. "Current standard solar panels lose a large amount of light-energy as it hits the surface, making the panels' generation of electricity inefficient," says Niraj. "But if the cells are singing bowl-shaped, then the light bounces around inside the cell for longer". Normally used in meditation, music, and relaxation, Buddhist singing bowls make a continuous harmonic ringing sound when the rim of the metal bowl is vibrated with a wooden or other utensil. During his PhD, Niraj discovered that his 'nanobowls' manipulated light by creating a 'plasmonic' resonance, which quadrupled the laboratory solar cell's efficiency compared to a similarly made flat solar cell. Now, Niraj and his team aim to change all that by applying his singing-bowl discovery to tandem solar cells: a technology that has previously been limited to aerospace applications. In research which will be published in the November issue of IEEE Journal of Photonics, Niraj and his collegues have shown that by layering two different types of solar panels on top of each other in tandem, the efficiency of flat rooftop solar panels can acheive 30 per cent—currently, laboratory silicon solar panels convert only 25 per cent of light into electricity, while commerical varieties convert closer to 20 per cent. The tandem cell design works by absorbing a sunlight more effectively —each cell is made from a different material so that it can 'see' a different light wavelength. "To a silicon solar cell, a rainbow just looks like a big bit of red in the sky—they don't 'see' the blue, green or UV light—they convert all light to electricity as if it was red ," says Niraj. "But when we put a second cell on top, which 'sees' the blue part of light, but allows the red to pass through to the 'red-seeing' cell below, we can reach a combined efficiency of more than 30 percent." Niraj and a team at ANU are now looking at ways to super-charge the tandem cell design by applying the Buddhist singing bowl shape to further increase efficiency. "If we can make a solar cell that 'sees' more colours and keeps the right light in the right layers, then we could increase efficiency even further," says Niraj. "Every extra percent in efficiency saves you thousands of dollars over the lifetime of the panel," says Niraj. "Current roof-top solar panels have been steadily increasing in efficiency, which has been a big driver of the fourfold drop in the price for these panels over the last five years." More importantly, says Niraj, greater efficiency will allow solar technology to compete with fossil fuels and meet the challenges of climate change and access. "Electricity is also one of the most enabling technologies we have ever seen, and linking people in rural areas around the world to electricity is one of the most powerful things we can do." Chinese Bianzhong bells could also be a source of inspiration. From Wikipedia: "They have a lens-shaped (rather than circular) section, the bell mouth has a distinctive "cutaway" profile, and the outer surfaces of the large bells feature 36 studs or bosses, symmetrically placed around the body in four groups of nine. This special shape gives zhong bells the remarkable ability to produce two different musical tones, depending on where they are struck." If they can be made at the nanoscale, a single stack could maybe achieve results comparable to two "singing bell" stacks. The ancient Chinese water bowls do the same, yes? I can't say the 'singing bowl' idea will or won't work, but it seems to me that resonance isn't really the goal. Absorption is. There may be other approaches to improving absorption that are simpler to use in manufacturing and achieve equal or better efficiencies, such as ring-shaped molecules tuned to the desired light frequencies, which also can be layered. Standard Optical Resonator Array, old tech repurposed with a religious story, how quaint. Buddha was not a god, he was simply the delivery guy of an instruction manual for the human psyche. The only thing that makes people call Buddhism a religion is the fear of realization that the only real "god" is your own mind.